Join the thrilling adventure up high in the sky alongside the Lucky Lady. Click here to play! This airborne slot is sure to intrigue even the most grounded slots player, so hop on board and take the controls today! 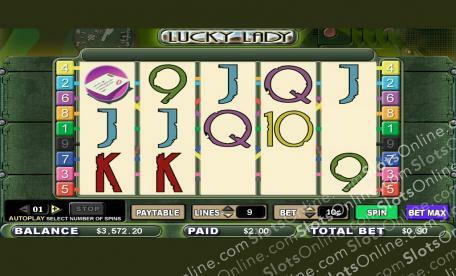 Lucky Lady is a brilliant 5-reel slot that is played across 9 glorious pay lines. The more lines that you activate also allows you to have a greater chance for landing winning combos. The Lucky Lady is Wild and shows up on reels 2, 3, and 4. Spin her up in a good combination, and see her transform into that symbol to earn you cash! There are two exciting Scatters, with Planes and Insignias both able to show up anywhere on the reels. Spin up three or more Scattered Planes and you’ll experience the high-flying Bonus Round! Take a trip with the Lucky Lady today and revel in the mystery of the skies. There are two Scatters at Lucky Lady, with Insignia and Planes both able to show up anywhere on the reels in order to earn up to 100 coins per spin. The Lucky Lady is Wild and can be subbed for any other symbol on the reels except for the Scatters. She will only appear on Reels 2, 3, and 4. To activate the Bonus Round, all you need to do is spin up three or more Scattered Planes from left to right. Cryptologic also gives you the ability to stop your auto spins when a jackpot is won, a single win exceeds a dollar amount, any win, an increase or decrease by a predefined amount or simply, when the number of spins are complete.Cryptologic slots give you the option of any number of auto play spins up to and including 99. It provides a delay between each spin between 0.25 and 2 seconds, giving you time to see exactly how much money you win each spin.